Simply add eggs, oil, water & icing. Only naturally sourced colours and no preservatives. Suitable for vegetarians. There is only 3 simple steps to bake one of Betty Crocker's cake mixes. With Betty Crocker cake mixes, you can bake perfect cakes, brownies and cookies everytime. Chocolate, vanilla, carrot cake, brownies: they just taste like heaven! Put a zing in your step with this fabulously moist and delicious and Zesty Lemon Cake Mix. Grab your apron and mixing bowl and fire up your oven to 180°C (160°C for fan assisted ovens)/Gas Mark 4. For cupcakes bake in a fan assisted oven at 160°C. It's baking time! Preparation 10 mins Baking time 23-28 mins Serves 12 All you need is: 90ml vegetable oil (6 tbsp) 180ml water 3 medium free range eggs 1 tub of Betty Crocker? 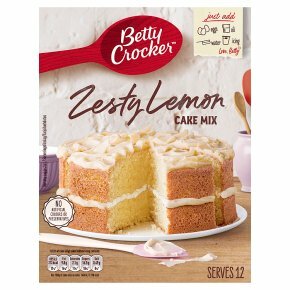 Zesty Lemon Icing 2 x 8" well-greased cake tins (or 2 x regular size muffin trays & cupcake cases) Only 3 steps to cake heaven... 1 Mix the eggs, oil, water and cake mix gently together and whisk (by hand or electric mixer) for 2-3 minutes until smooth and creamy. 2 Pour the cake mixture evenly into your two greased cake tins. For cupcakes pour mix evenly into the cupcake cases**. 3 Bake in the centre of the oven for 23-28 minutes or until a rounded knife inserted into centre of the cake comes out clean. For cupcakes bake both trays together for 18-22 minutes**. Then cool on a wire rack. Sandwich your cakes together and cover with lashings of Betty Crocker? Zesty Lemon Icing. Enjoy a delicious slice of this moist and zesty lemon cake. **For full cupcake recipe suggestion please see www.bettycrocker.co.uk Bake it yours Add grated lemon zest cake mix and icing for an extra zing!